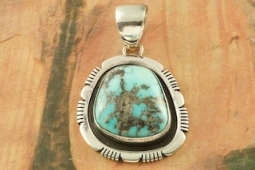 Stunning Pendant featuring Genuine Morenci Turquoise set in Sterling Silver. Morenci Turquoise is one of the first American Turquoises to come to the market, Morenci is highly valued and difficult to obtain. The Morenci mine is in southeastern Arizona and is now closed and buried under tons of rock. Morenci Turquoise is now obtained from private collections. 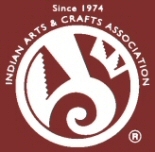 Created by Navajo Artist Kevin Willie. Signed by the artist. Free 18" Sterling Silver Chain with Purchase of Pendant. Pendant is 2" long including bale x 1 1/4" wide.